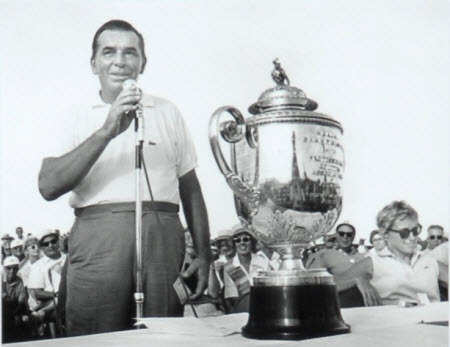 The PGA Championship – arriving last on the golf calendar and being last priority compared to golf’s other majors – also has far fewer memorable moments than its cousins. Most of that is because for the first four decades, the championship was contested at match play which produced far less golf. To pay tribute to those match play days, we will split our remembrances into five from the match play era and five from stroke play. 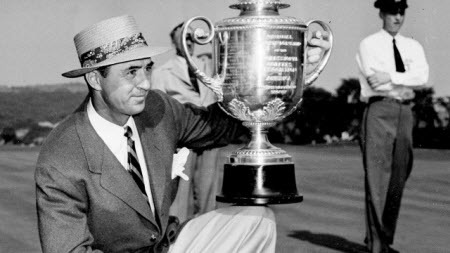 Walter Hagen and Gene Sarazen were the two greatest American professional players of the hickory-shaft era, and between 1921 and 1927 they won all the PGA Championships. They only met in the finals once, in 1923. 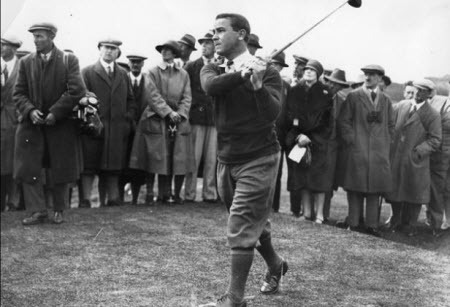 The showdown took 38 holes to decide with Sarazen, who won the previous year at the age of 20 to become the youngest champion ever (Hagen missed the tournament do to an overbooked exhibition schedule), prevailing after sticking a wedge to within inches of the hole. Hagen would win the next four titles against four different foes. 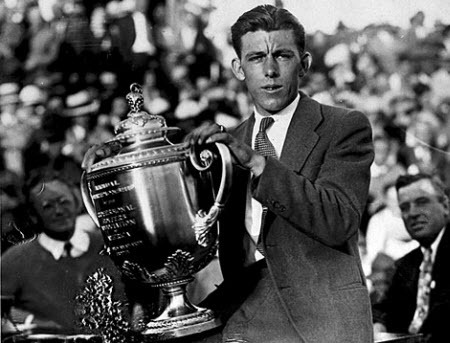 Another 20-year old, just two months older than Sarazen had been, lifted the Wanamaker Trophy in triumph in 1931. 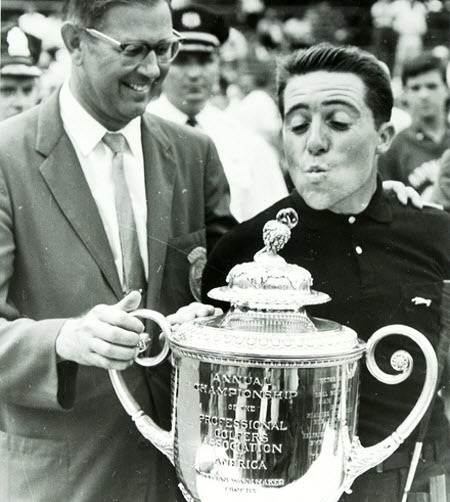 Tom Creavy was an early day “boy wonder” on the links who defeated Sarazen on his march to the title. Refereeing the final match against Denny Shute was none other than recently retired Bobby Jones. Creavy injured his back a few months later and never fulfilled his great promise. Sam Snead won his first major championship in Atlantic City, New Jersey with his Navy bunk waiting for him the following day in 1942. His opponent was an Army corporal named Jim Turnesa, from golf’s greatest family dynasty. Turnesa had a comfortable 3-up advantage after the morning 18 holes but Snead clawed back and sealed the win with a 60-foot chip-in on the 35th hole. 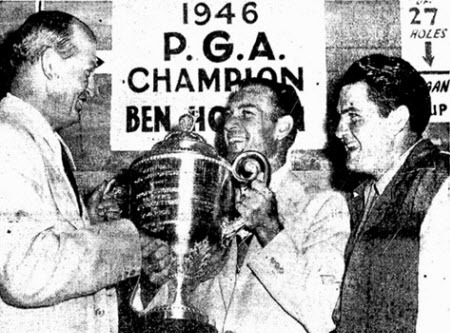 In 1946, Ben Hogan was 34 years old and had piled up 30 wins, but still had not won a major tournament. That all changed at Portland Golf Club. The victim in the final was hard-luck veteran Ed “Porky” Oliver, one of the best-loved pros on the circuit. There would be another 33 wins and 8 major titles for Hogan after closing Oliver out 6 and 4 on the 32nd hole. 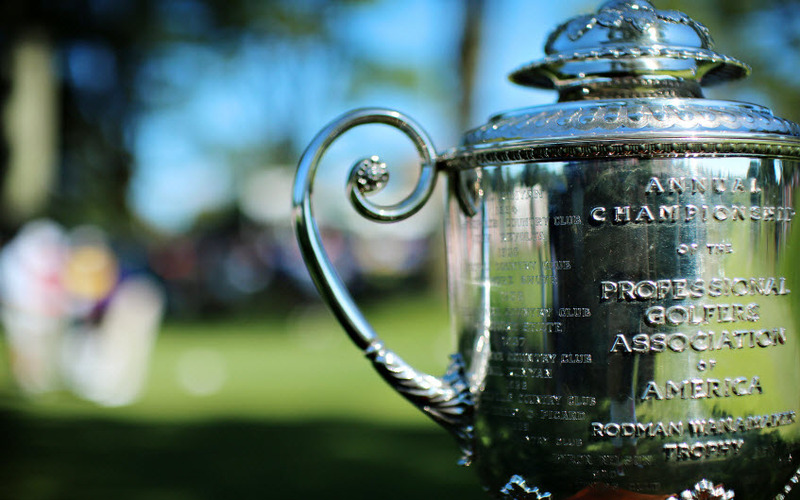 It should never be forgotten that the PGA Championship is the tournament of the backbone of American golf – the club pro. 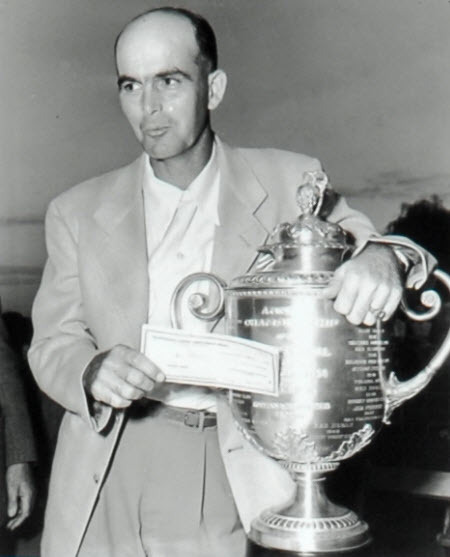 The last player to win the PGA Championship who made his living primarily as a club professional, was Chandler Harper out of Portsmouth, Virginia. He won the Virginia State Open a record nine times, but showed up on Tour enough to notch seven victories and earn a reputation as a short game wizard – a skill particularly lethal in match play as he demonstrated in his 4 and 3 final win at Scioto Country Club. A 10-year old club member was escorted into the clubhouse during the tournament by club teaching pro Jack Grout, where the star-struck young golfer got Sam Snead’s autograph and others. That 10-year old was Jack Nicklaus. Arnold Palmer never won the PGA Championship but had three runner-up finishes. This was one of those. On the 72nd hole, the King hooked his drive into a television stand and got a free drop. 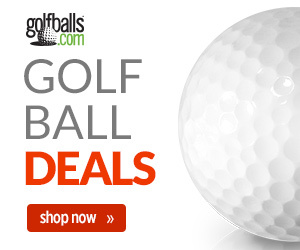 He then lashed a 3-wood to within eight feet but missed the putt that would have forced a playoff. The winner was Julius Boros at the age of 48 and no PGA Champion has ever been older. Gary Player was already on the bogey train on Sunday when his tee shot strayed right towards the pond at the 16th hole at “The Monster,” as Ben Hogan had called Oakland Hills. His ball stayed out of the water but he was so deep behind a willow tree that he had to borrow a fans’ chair to stand on and try to see the green. 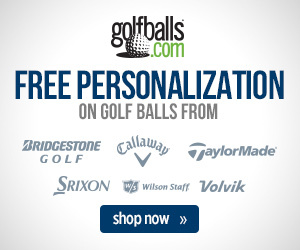 Player launched a nine-iron over the willow to within four feet of the pin, leading to a birdie and a two-stroke win. John Daly was the ninth alternate to get into the 1991 PGA Championship. 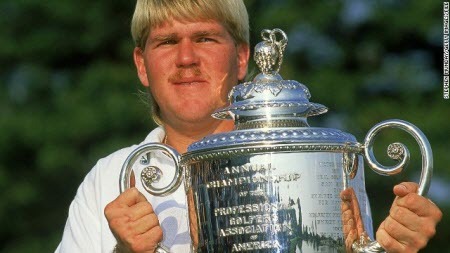 Who was John Daly in 1991? No one knew. When Nick Price was forced to withdraw for the birth of his child at the final moment, a scrambling Daly hired his caddy. Four days later Daly had won by three strokes and a legend was born. Time has tarnished the unbridled joy a 19-year old Sergio Garcia gave golf fans when he delivered a fairway sprint and scissors kick after executing an improbable iron shot off tree roots on the 16th hole of Medinah. However, Tiger Woods won his first PGA Championship anyway, Garcia still is looking for his first major, and the great rivalry all the golf world anticipated never materialized. Only time will tell if the 2015 version of the PGA Championship taking place at Whistling Straits will live in infamy. However, with the likes of youngster Jordan Spieth on pace for a record year, Dustin Johnson pounding it down the fairway and Jason Day knocking on the door, it’s bound to be memorable to say the least.